BMW is changing the layout of its US plant to add production of the X3. BMW is splitting up the manufacture of its X3 crossover in Spartanburg, S.C., to allow high-volume production with a higher-than-normal parts complexity. Inside its nearly completed new assembly plant in Spartanburg, South Carolina, BMW is preparing to become more efficient. The $750 million construction project will result in an assembly process that brings BMW closer to its core challenge as an automaker: how to produce vehicles at the lower end of its product portfolio using lean manufacturing while letting customers have a dizzying degree of ordering freedom. The new plant — adjacent to BMW's X5 and X6 assembly plant — will produce the smaller X3 crossover. As with its previous-generation X3, currently built in Graz, Austria, BMW will let a customer change his mind on an X3 factory order as the vehicle moves from order to delivery. BMW execs believe that accommodating build-to-order changes helps boost brand loyalty. But BMW faces the challenge of doing that economically in the increasingly expensive world of automaking. BMW resolved the question at its 1- and 3-series car factory in Leipzig, Germany, opened in 2005, with a radical assembly process it dubbed fingers. A young engineer proposed the assembly layout as the most efficient way to achieve high-volume production with higher than normal parts complexity. The South Carolina plant is adopting the Leipzig approach, which places a premium on getting components from suppliers directly to where they are needed on the assembly line. The new Spartanburg plant layout leaves expensive fixed factory processes such as body welding and painting in a common area back in the X5, X6 factory. Painted X3 bodies will travel a third of a mile across BMW's property on an enclosed conveyer to the new plant. While most factories are box-shaped when viewed from above, the new BMW plant is laid out like a hand with three long fingers, or corridors. The assembly line moves up and down the three fingers where various tasks will take place, such as door module assembly and engine, cockpit and interior installations. Receiving docks line the walls of each corridor, so small batches of components can enter the plant and move directly to their point of vehicle installation, says Richard Morris, vice president of assembly at BMW Manufacturing Co. The palm area of the plant's layout is devoted to such things as administration, vehicle inspection and testing, and a cafeteria. "We decided that the most efficient way to bring in parts is to use the shortest and most direct path," says Morris, who joined BMW in 1993 and was promoted to his new job in June. "This is a more associate-oriented approach to building vehicles," he says. "It does away with much of the inventory that they don't need and allows them to focus on the immediate task at hand. Build-to-order is who we are. We embrace that. But it's the mastery of complexity that we're after here." Automated carriers will move parts out of a warehouse and into the X3 work stations and will carry away empty cartons and trays. Fewer parts will be kept by the line than in a traditional auto assembly operation, meaning less space will be required at each work station, Morris says. Should it decide to expand production in Spartanburg, BMW would be able to increase capacity by adding fingers or extending the existing fingers, without redesigning the entire plant as it has had to do in the past, Morris says. This is the fourth major production layout at BMW's U.S. plant. When the plant opened in 1994, it built 3-series sedans and Z3 sports cars on an assembly line that looped like a handwritten cursive "e." The line broke a cardinal rule of mass production by crossing over itself. BMW designers intentionally made the crisscross so that workers would have two views of each car as it progressed, to underline the importance of quality to its first U.S. manufacturing work force. 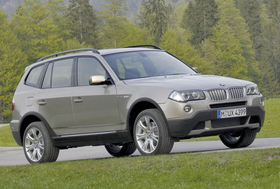 In 1999, BMW turned to a more robust and automated production system with a second line that turned out X5 crossovers, leaving the Z line as it was. Then in 2005, BMW did away with the two-line system and united all production in a single line. That change was intended to maximize flexibility, the company said at the time, allowing workers to shift between X's and Z's as customer orders dictated. The new fingers approach is intended solely for the X3 for now, Morris says. In time, it will be considered for the other Spartanburg plant.